Somehow, I have a special magnetic field to chocolate. The store filled with chocolates sucked me towards its shop window and upon browsing through the very tempting chocolates and nougats, we saw a staircase with a sign that says Daskalidès Cafe downstairs. Looks like we found an almost hidden gem. 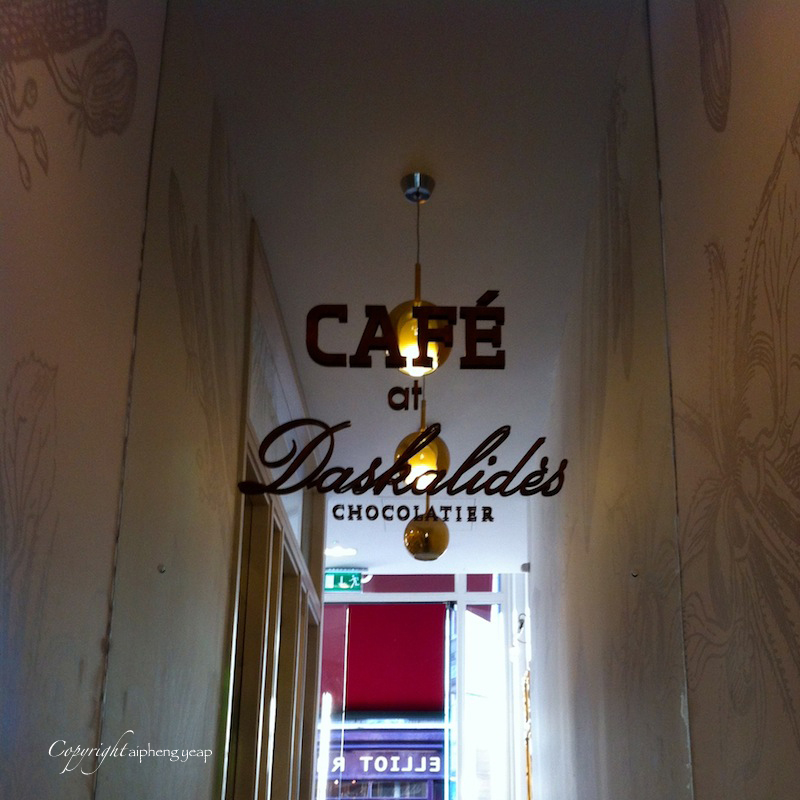 Daskalidès is a Belgian chocolatier and has stores around the world. This is their London flagship store and cafe, also their first store in UK which just opened in June 2012. The store owner mentioned we will be embraced with more stores. 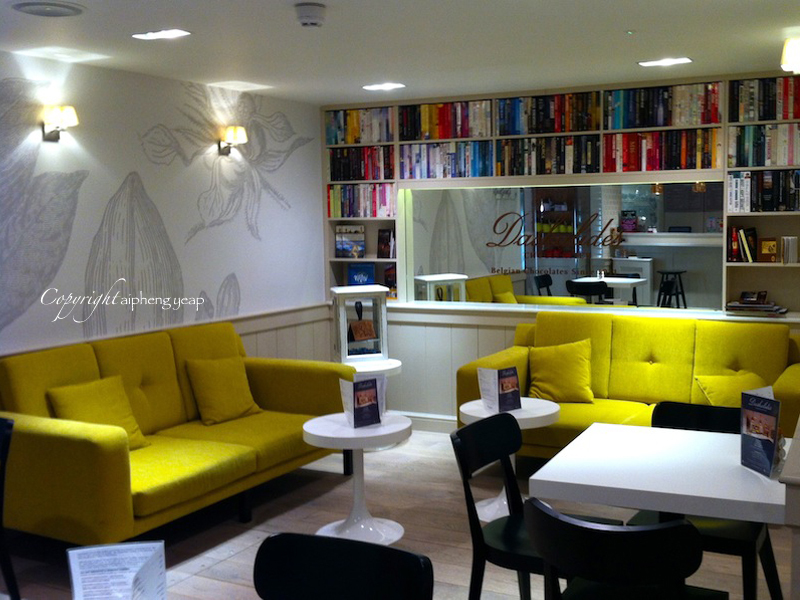 This rather new cafe was so pleasant to be in; calm and light, also chic with the bright chartreuse yellow sofa and hanging copper pendant lights. A small brick wall arch section in the cafe with boxes of chocolates on display and other goodies. As much as I like marshmallows, I preferred the rolled cookies as a light sinking of teeth makes it crumble and melts with the warm chocolate. It gets better when eaten with the sugar toasted hazelnuts. 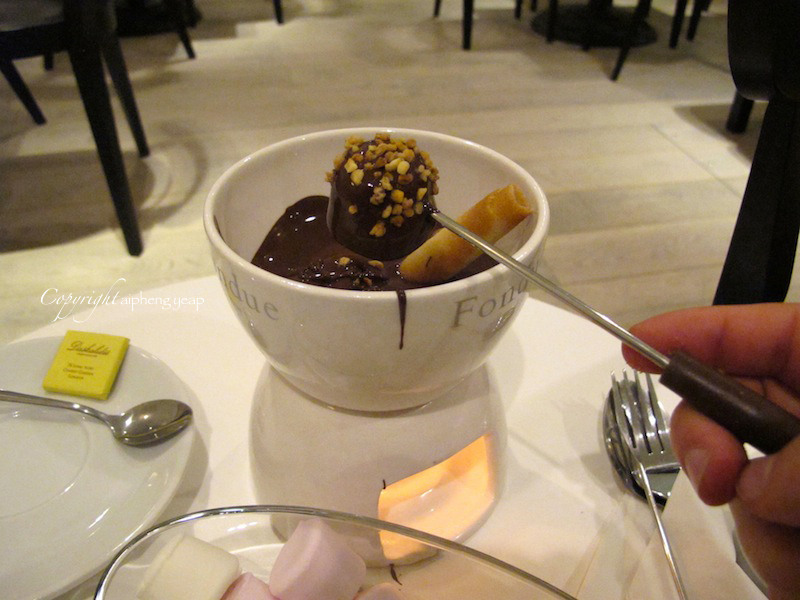 Very decadent chocolate fondue and chocolate moelleux (in the midst) with soft gooey centre. 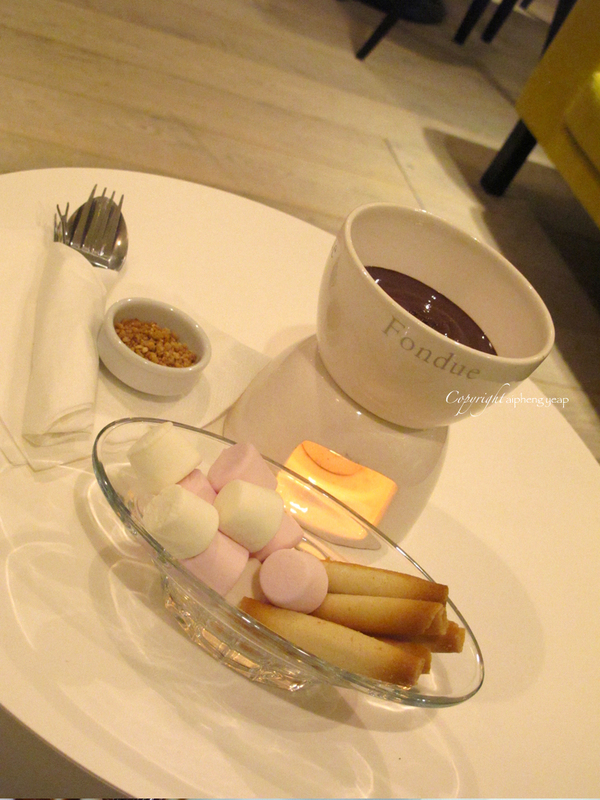 The smooth hot chocolate is their speciality so remember to have this when you drop in. They have dark or milk hot chocolate to cater for your liking. 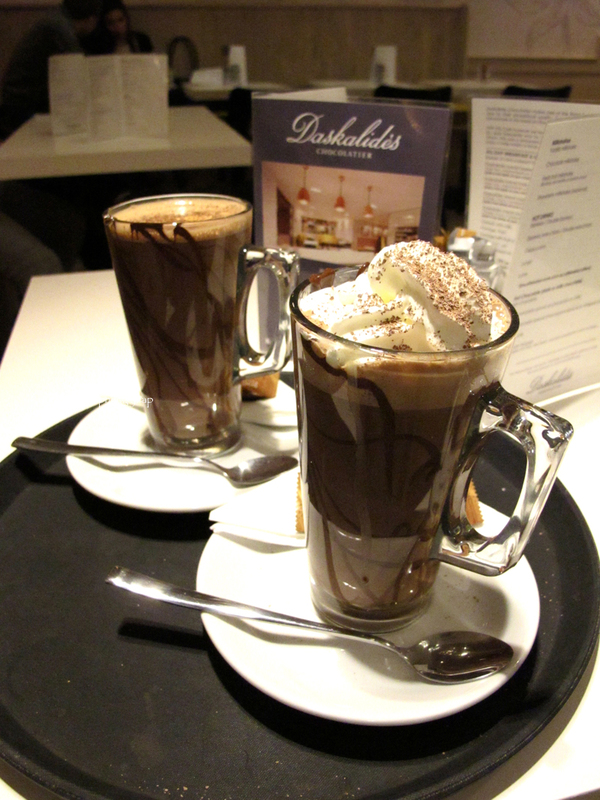 There is even spiced hot chocolate with cinnamon or chilli, or with cream and marshmallows for when you feel naughty. Decadent and lovely ambience, even has free wifi. They even serve breakfast here, with Croque Monsieur and Croque Madame on the menu. The books on the shelves are purely for decorative purposes. They are only book covers and are stuck together, so not readable. 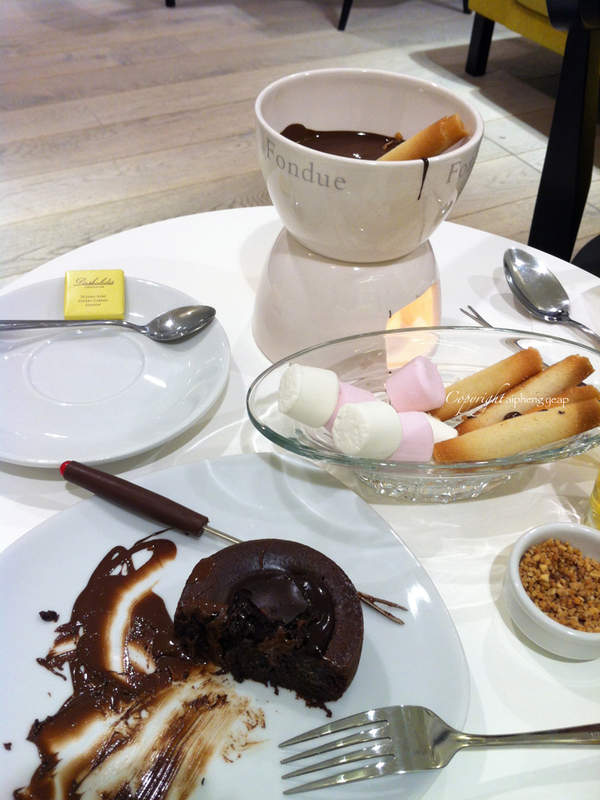 Who will say no to chocolate decadence!! ?